Packed with seasonal apples and spices, this spiced apple cake is perfect for the colder days of autumn. It is a super easy bake and was a big hit with my kids, especially when still slightly warm. Delicious served warm or cold, this is a moist, autumnal tea time treat. Preheat the oven to 160°c (fan oven), and grease and line a 20cm dia round cake tin. Cream together the sugar and butter in a large bowl, until light and fuffy. Slowly add the beaten egg, a little at a time. If the mixture begins to curdle, add a tablespoon of the self raising flour. Sift the spices, baking powder and remaining flour into the bowl, and fold into the mixture until combined. Peel and core the apples, chopping four in to chunks of approximately 1cm. Slice the other two apples thinly. 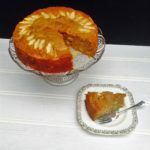 Fold the chunks of apple into the mixture and pour in to the cake tin. The apple slices should be arranged on top, with the demerera sugar sprinkled over them. Bake for 50-60 minutes. Test the cake by inserting a thin skewer or cake tester into the middle. It is ready when the skewer comes out clean.